random facts + super happy creative day! i got tagged! by elizabeth of the crafts of destiny. so the thing is: list 7 random things about yourself and then tag 7 more people to do the same… here i go! 1. i grew up thinking tofu was super gross because of clarissa explains it all, and now it’s a staple of my diet and one of my favorite things. 2. in the 9 years since i turned 16 and got my first regular job (paycheck, non-babysitting), i’ve had 11 jobs, counting every one with a normal paycheck (so this does include operations manager at my college radio station where i got paid $35/week, but it does not include teaching photography at an after-school program for several months because i just got one check at the end). i’ve never been fired, i have been laid off once, and many of those jobs overlapped. 3. i’m terrible at keeping my computer cleaned up and organized – right now i have 27 firefox tabs open (all sites i plan to use and/or check out soon! ), and 164 unread emails in my yahoo account (all just comment notifications and stuff, no personal emails). 5. after a weekend trip to scotland during my summer spent studying abroad in england, glasgow became my favorite place in the whole wide world and i wanted to live there someday (but only temporarily because of the weather), so a couple weeks ago while exploring ancestry.com or one of those sites, i was so happy to learn that my great great great grandfather (or maybe one more great…) was from scotland! 6. i love film, and hate that it’s getter harder to buy, and wish more people would shoot it, buut i’m totally embarrassed to admit that since i got my digital slr in january i haven’t shot one full roll of film. boo me! 7. in college i went to tons of little indie shows – after i turned 21 my average was probably 3-4 a week – but my first concert ever was the kroq weenie roast when i was 17, where i saw lovely bands like blink 182 and sugar ray! hah! ok and now for the tagging: i choose amber, jessica, diane, christine renee, kristin, susan, and pete. not a big deal, do it if you want to. 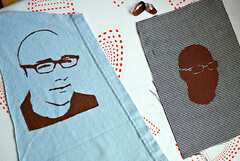 if you want to try it, here is a great online tutorial with a rad squid stencil, and this guy used bleach instead of fabric paint, which i plan to try next time (he inspired me to make a stencil of pete’s face). 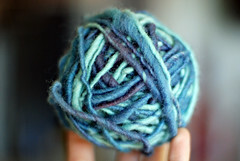 and, i spun yarn for the second time, my first time using roving that i dyed (with food coloring and kool-aid), so i feel like it’s really my yarn, because i designed it and made it happen. so exciting! 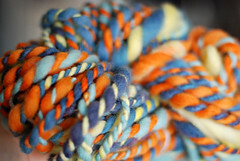 one strand is orange + yellow, the other light blue + dark blue with some purple, spun kind of randomly back and forth, and plied together. 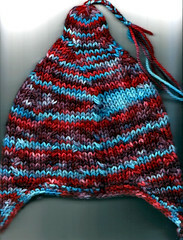 multi-colored custom yarn with kool-aid, part 2!! 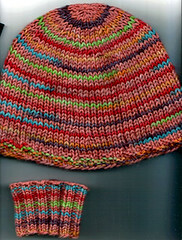 ok part 2: complicated multi-colored self-striping yarn! 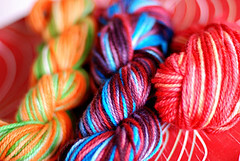 so after i made that variegated yarn i explained in part 1, i had ideas to take it further – i started to design a kool-aid dyed yarn that would have looong sections of different colors, with one base hue, and the other shades rotating randomly. 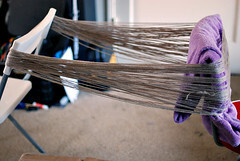 my first attempt at this concept involved yarn wound into a hank around chairs at opposite ends of my (small) apt, and extreme tangling throughout the dyeing process. this resulted in way-too-long color sections (much wider stripes than i’d wanted) and because i didn’t quite know what i was doing, the colors weren’t random at all. i had the base light blue, with a bunch of red stripes, then a bunch of green stripes, then a few orange stripes at the end. so, i took what i’d learned with that failed string of ideas, and came up with a successful process! which i will now share with you!! 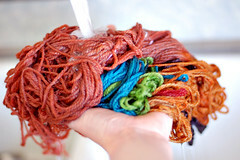 if you are new to dyeing, first read my part 1 post and check out some of the tutorials i linked to. 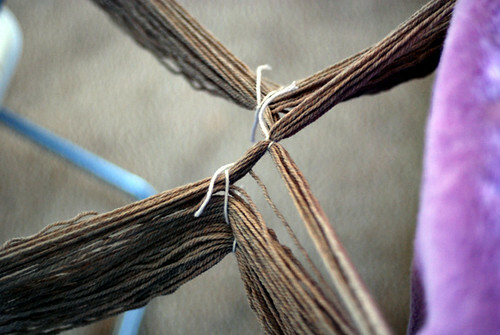 you’ll want the basic dyeing process to be familiar to you before trying this striped yarn. 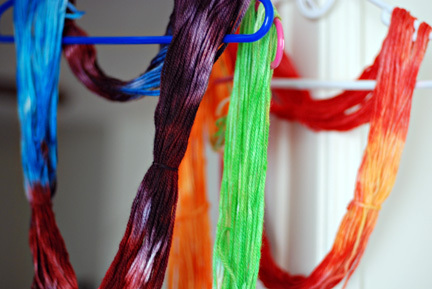 i am not going to go into detail about things like heating, rinsing, etc in this tutorial because i went over that stuff in part 1.
when it’s all wound, divide the yarn into sections – each section will be one color, so do as many as you want. 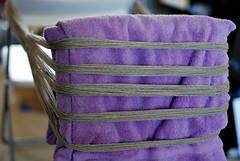 now use scrap yarn pieces (preferably cotton) to tie all the yarn together somewhere in the middle of the chairs on each side. this will determine how long your stripes are – if you tie right in the middle, then the base color and random color sections will be almost the same length. 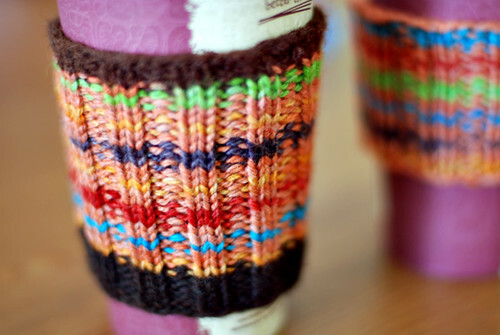 if you want mostly the base color with small spurts of random colors, then tie close to the divided sections. the stripe dye will not go quite all the way to the ties, so keep that in mind. 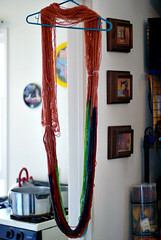 tie in a figure 8 tight enough to hold, but loose enough for the dye to get to the yarn. now, move the chairs a little closer together and tie the top section together just before the points where all the yarn is tied. this is kind of hard to explain but hopefully the picture will make it clear. do this with each section. i didn’t do this in this example, but if you don’t want extreme tangling, you really need to tie it in more spots – a couple spots in each of the different color sections (figure 8’s just like the other ties), and a few more spots on the other side. 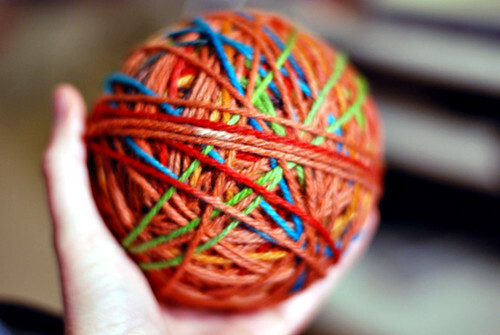 all these ties will the keep the yarn in order and make you much happier when balling it up. 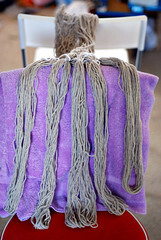 ok now it’s ready to dye! 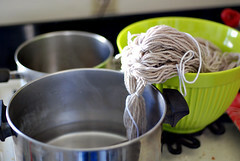 prepare your stovetop with one large pot for dyeing the sections, and two big bowls/pots to hold the rest of the yarn. 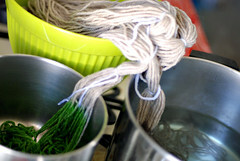 i used a mixing bowl for the dry yarn, and a pot for the wet, dyed yarn. 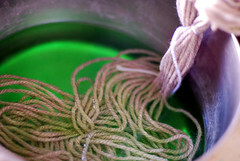 put all the yarn in the bowl, some water in the dye pot, and submerge one stripe section in the water. mix your first color while it’s soaking. 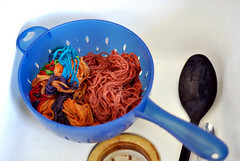 another thing you should probably do differently than i did here – the yarn will take up the dye best if you soak it first, for about a half hour. 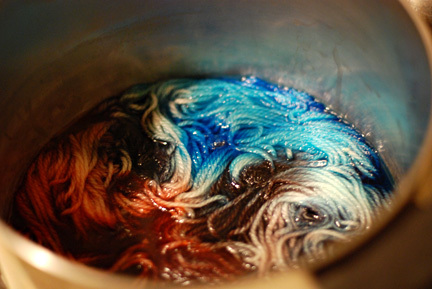 for this yarn, i just let each different color section soak for about ten minutes before adding the dye, which works, but then you’re adding more time to the dyeing process, whereas just soaking all the yarn at once beforehand would allow you to dye one after another without soaking each separately. now repeat for each stripe section. when adding new colors into the third pot, put the darker shades on the bottom just in case of color dripping (the colors shouldn’t drip/bleed but better safe than sorry). 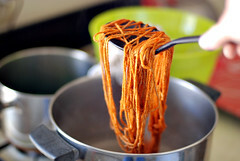 note: if the yarn fully absorbs the dye, there will be no bleeding – so if there is bleeding, you didn’t let it simmer long enough. 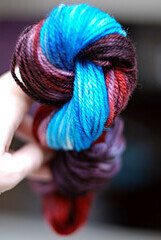 ok when all the stripe sections are dyed, you can dye the base color (if you want to). i actually regretted dyeing the base with my yarn; i had wanted just a neutral brownish kind of shade, and it ended up much pinker than i wanted, so i would have preferred the original grey shade. 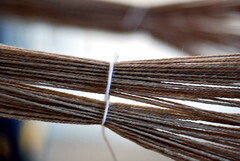 so, be careful because the base color will really determine how your final yarn looks. dye right up to the edges of the stripe colors, but beware of overlapping colors, especially if you’re using complimentary shades that won’t look good when mixed. 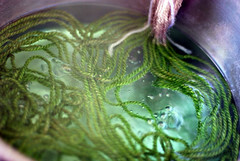 when all is dyed, pour everything into the colander and let cool completely to room temperate, then rinse. 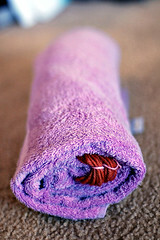 squeeze out water, then roll in a towel and step the water out. 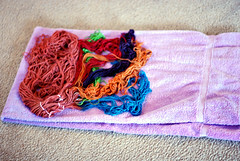 carefully detangle the yarn now and hang it to dry overnight. when it’s dry, put it back over the chairs, untie all the ties, spread it out on both ends, and carefully wind it into a ball. yay! hope that all made sense. 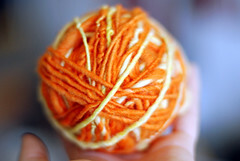 if anyone out there uses this tutorial, i would love to see your yarn!! 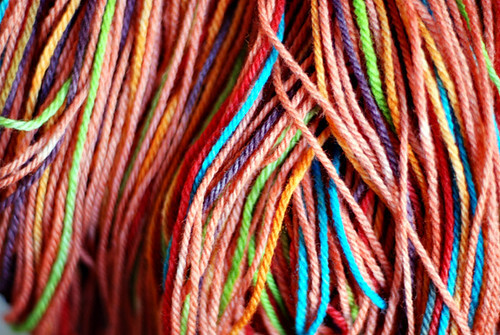 multi-colored custom yarn with kool-aid, part 1! google “kool-aid dye” to find tonnns more! in the last few months i’ve been experimenting quite a bit, learning from my (many) mistakes, trial and error… i started out dyeing over some brown yarn and green yarn i already had lying around, then bought a skein of off-white wool to play with colors. i divided that one skein into 3 hanks, one small, then a little bigger, and bigger, so i could start with the smallest and hope by the time i got to the biggest i would be able to get what i wanted. and it worked! 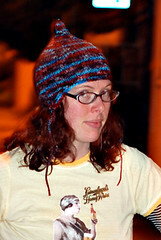 and that final biggest hank was enough yarn to make into a hat! so, i’m gonna tell you how i got that color variegation, because it took me many tries to perfect my techniques. first things first – you’ll need: some wool or wool+other animal fiber blend (like angora, alpaca, cashmere… if there’s a small percentage of nylon or other non-natural fiber, it’ll be ok) yarn (this example is 100% wool) wound into a hank and tied in a few spots (not too loose, not too tight) with contrasting yarn (i use acrylic so it won’t end up the same color – cotton is best), a big pot, a stove, a colander, a spoon, a cup to mix kool-aid in, kool-aid of course, and a sink. 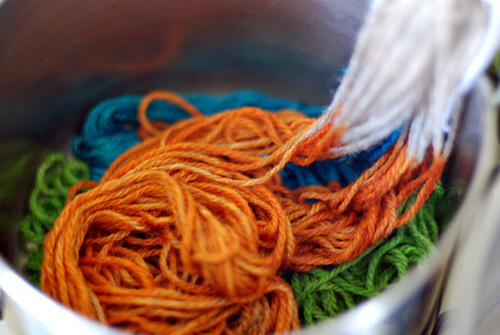 first, fill the pot about halfway with hot tap water, and submerge the yarn in it (use as much water as needed to cover the yarn), let it soak for about a half hour so the yarn absorbs the water. while it’s soaking, you can mix your kool-aid colors. use very little water (a couple inches) for each color. choose colors that will blend together nicely (be careful with complimentary colors) because even though you’ll try to keep them separate, they will blend in spots. you can dip a piece of white paper towel/napkin in to test the color, but you won’t know exactly how it’s gonna turn out until you see the final yarn (so if it’s important to get exactly the right shades, you’ll have to test-dye small yarn samples). 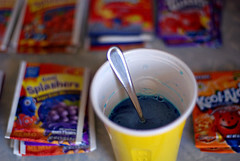 you can also skip this step and pour the kool-aid powder directly into the dye pot. 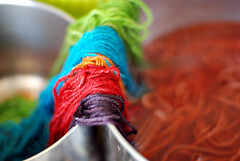 after the yarn is soaked, pour most of the water out – hold the yarn in the pot with a spoon and drain all the excess so the remaining water is not quite covering the yarn, but close. this is the key to getting the variegated colors with minimal blending. 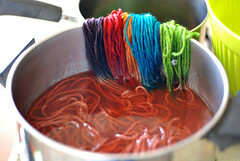 the more water in the pot, the more the colors will float and travel and blend… now, start heating up your yarn pot. you want it to lightly simmer, or not even quite simmer, and definitely not boil! 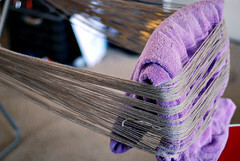 with too much agitation and/or temperature change, the yarn will felt and be ruined, so always keep an eye on the water to keep it hot, but not too hot. now squeeze the water out, but don’t ring or twist it. 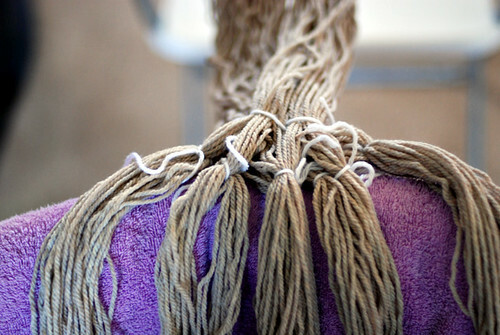 i like to squeeze as much water as possible out by rolling up the wet yarn in a beach towel and stepping on it, then it doesn’t drip when i hang it. 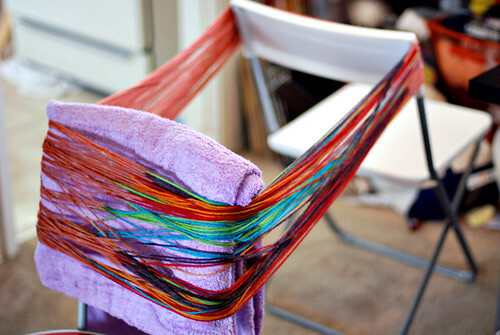 hang it to dry overnight either on your shower head, shower curtain rod, or on a hanger in a doorway. when it’s all dry, wind it into a ball and you’re ready to use it! yay! 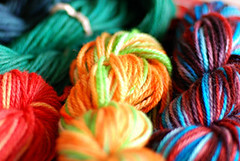 part 2 will be a more complex method i’ve come up with for many-colored self striping yarn, and there will be tons of pictures accompanying that post! soon! 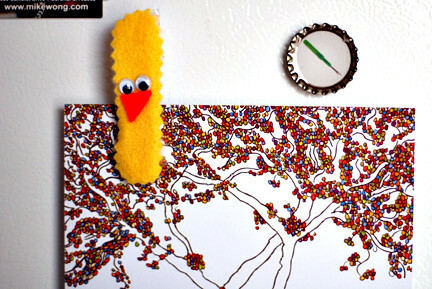 love this little crafty world! so i was checking out all those sampler contributor sites i linked to yesterday, and when i noticed how familiar her etsy shop looked i realized that i actually know christine renee of re-conceived. i custom made a camera bag for her a few months ago. 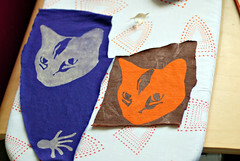 so my favorite sample item was made by someone who carries something i made for her, so weird! such a small crafty world!! yeah, that’s all really, i had to share that… oh, she has a rad blog by the way, and not just because she mentioned me in it today, hah! 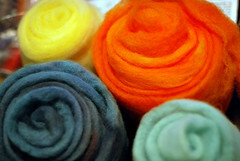 she talks about recycley craft stuff like “frogging” sweaters to recycle the yarn, yay! woo, this is a good week! first, on monday, do stuff! got mentioned in an interview with reference librarian Laural Winter about zines in portland libraries on Sister Diane‘s DIY Alert! website. yay!! then yesterday i got home to work to find my sampler package in the mailbox! i hadn’t been expecting it for a few more days, so i was extra super excited! it was my first time contributing, and also my first time getting one. here are my favorite samples! the octopus is an iron-on patch silkscreened on recycled fabric, designed on a manual typewriter using only the letter “y”. it was made by christine renee of re-conceived, and designed by her brother nathan veech, and the octopus’s name is phil! the so so cute “congratulations!” card is by andy pratt design; there’s a “happy birthday!” card too. i love the nut and bee button!! 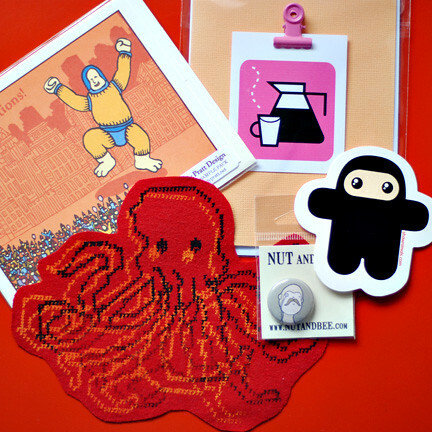 the “wee ninja” by shawnimals is totally going on my car. and the “i love you a latte” card by fancy is so me! cofffeeee mmmm…. and just so ya know, i do have plans to try to blog more… i have a couple tutorials planned, i just need to write them… at the moment i actually need to be finishing up my wristbands for next month’s sampler contributions. but soon, i promise, some fun tutorials are on their way. yess!